Beginning Friday, December 1, 2018 and on the 1st Friday of every month to generate advocacy for YOUR school library, NJASL challenges school librarians to post information about their accomplishments in their school library. Use whatever tool works best for you and your school library (Facebook, Twitter, Instagram, Newsletter, Webpage). Please remember to tag @NJASL and use hashtags #njasladvocacy and #njasl. Looking forward to seeing #njasladvocacy Strong! Click on the link for Advocacy Challenge pertinent details. the development of digital literacy skills and improve academic achievement. 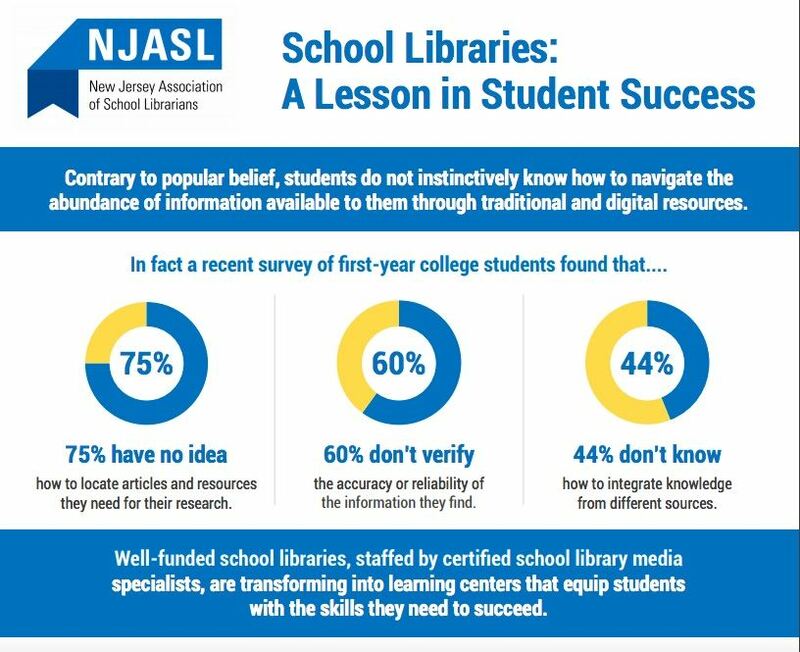 School Libraries: A Lesson in Student Success (2018) - A printable two-page updated version of the NJASL Infographic above. Infographic provides highlights from Library Research Service (LRS) on the impact of school libraries. Librarians are also included on the checklist of Quality Educators that are needed to provide full opportunities for students. This paper, written from the perspective of a school, public, and academic librarian, discusses why school librarians are essential: not only for the K-12 students, but for information professionals and users of information everywhere.